Accounting is a growing field, with an expected job growth of 11 percent by 2024, according to the U.S. Bureau of Labor Statistics. This high demand will need to be filled by accounting professionals, skilled in accounting analysis, record maintenance, and financial reporting among many other skills. By getting an online associate degree in accounting, students will be able to complete a self-paced program that can prepare them to earn entry-level positions in this growing field. Our guide has all the essentials to help prospective students learn more about earning an associate degree in accounting online. What Can You Do After Earning Your Online Associate in Accounting? When it comes to juggling work, school, family, and other responsibilities, choosing a degree program that suits your personal needs can be challenging. Online accounting degree programs offer students the flexibility to create their own schedule and learn at their own pace, offering a solution to this time-demanding struggle. 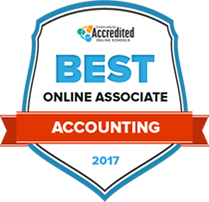 To help sort out the ever-growing list of schools, we have put together a ranking of the best online associate degrees in accounting programs for 2017. The emphasis of the Stark State College accounting program is the application of accounting practices in the field of health administration. Courses emphasize accounting principles and also medical terminology, health care delivery systems, and the complexities of insurance and reimbursements. This associate degree of applied business in accounting will help students who graduate secure employment as an accounting clerk, an accountant, an office manager, or a medical coder in a hospital or in other health care facilities. The college also has transfer agreements in Walsh University and Franklin University for those who are looking to continue their education. CState Online Learning provides students who need flexibility in their higher education the opportunity to take one of more than 200 fully online or hybrid courses at Cincinnati State. The school has offered distance education since 1995 and now has seven online associate degree programs, including hospitality management, accounting technology, pre-business administration and medical administrative assistant, among others. The school boasts more than 2,400 co-op job placements every year with more than 600 business partners. It caters to non-traditional students, with about a third of its population being 30 years old or over. An associate in applied science in accounting from Tulsa Community College can help graduates get ready for careers as bookkeepers, accountants and auditors. The programs is available both on campus and online, giving students the flexibility they need to move their education forward. Students can also earn a certificate in the field and complete programs in 21 to 30 hours, depending on which route they take. The school has four on-site campuses and serves about 27,000 students each year. And honors program is also available for qualifying students. Albany Technical college provides basic adult development programs and associate, diploma and technical certificates in business, sciences, health care technology, personal services and industry to about 5,500 students every year. It offers 30 distance learning programs completely online and blended courses that meet both online and on campus. Students access coursework and instructors via the Blackboard online learning system. Most online courses are asynchronous, so students can work at their own pace as long as they submit assignments and participate in class discussions in a timely manner. The mission of the school is to offer its students advancement of skills, knowledge and personal growth. The accounting program at East Mississippi Community College is offered through the social science and business division. Students hoping to transfer to a four year university or college can receive academic advisement to ensure that the classes they take will transfer easily upon completion of the program. The accounting portion of the program includes a combination of college level math courses, fundamental business courses, and accounting theory and application courses. The accounting program is supplemented by the college’s general education core classes that total 33-35 credit hours. The college has four different campus location options for accounting courses. The online associate in applied science degree at Northern Hennepin Community College matriculates to several area university bachelor’s degree programs. The program teaches business foundations, with courses in the specialty area and allows students to take electives in an additional area of interest. In addition, NHCC has more than 60 degree and certificate programs in a wide range of fields, such as histotechnology, theatre, Spanish and marketing and sales. Most programs can be completed entirely online and the school is authorized to offer courses to students in nearly every state. Iowa Lakes Community College offers a number of learning formats to help reach as many students as possible. From evening classes to flexible terms, hybrid programs and independent study, there’s a number of opportunities for students to balance an education with work and home commitments. More than 800 of ILCC students take at least one online course, which includes threaded discussions for the students and instructors to communicate. The accounting specialist degree, diploma and certificate programs are completely online, as are degrees in business administration, human services and a diploma as business specialist. Students who complete the online accounting program at Columbus State Community College graduate with the knowledge and experience to work in a variety of positions in the field. This is one of nearly 20 disciplines available completely online, from certificate programs through graduate degrees. Classes are available in 8- and 5-week terms so students can accelerate their learning and graduate sooner. Some of the programs require in-person components, like labs and clinicals, but the majority of the online programs are completely online. The school has transfer agreements with a number of institutions. The Hinds Community College accounting technology program is designed for students looking for a career in the accounting industry as well as those who are currently employed in the accounting industry and are looking to hone their skills and advance their career. Students who complete the program can use their earned credits to transfer to a four year university or college. After completing the 66 semester credit hours required and a career planning and assessment system exam, students are awarded an associate of applied science degree in accounting. HCC offers career coaching and advisement to help students find and secure gainful employment after graduation. Accounting students at Northeast Community College learn the latest industry principles and how to apply them in real-life situations. Students can opt to participate in an internship to gain on-site experience at a cooperative organization. There are nearly 20 degree, diploma and certificate programs available online, including accounting and general business. An online advisor is available to assist students through the process and ensure that students are taking the correct classes for their career objectives. The school serves about 7,000 traditional students and more than 16,000 non credit students each year. When looking to find the school with the perfect fit to begin your program, there are some important things to consider. Affordable tuition or financial aid packages, accreditation, a good academic programs, and a good reputation are just a few of the things that can set a school apart. To specialize schools to your needs, check out our search tool below. There are many qualifications that accounting schools look for while screening potential students, with each school having different requirements students need to complete when looking to enter the program. Once accepted, students generally complete around 60 credit hours of study, which leads to an associate degree and possible certification. The following timeline allows students to see at a glance what they can expect during their online associate accounting degree program. Before sending in your application, make sure to check out the admissions process for the specific program to see if you can complete all requirements. Here are a few examples of steps students may need to complete in order to be enrolled in an online associate degree in accounting. Students must submit an official copy of their high school transcripts. Students may also submit transcripts from any prior technical or post-secondary schools they have attended. Special attention may be given to grades in courses that relate to accounting, such as math, statistics and economics. Although not all online programs require standardized test scores for admission, those seeking admittance to more competitive programs may need to take the SAT or ACT. After taking these tests, students must submit their scores to prospective schools, and in some cases, meet minimum score requirements. Some online programs may set minimum GPA requirements, which are often about 2.0 or 2.5. If you do not meet the GPA requirements, you may be required to take an entrance exam before entering the accounting program. Strong math and technology abilities are important skillsets that will be developed throughout an accounting program. Students with a good baseline for math skills as well as an ability to learn how to use different accounting software programs may be best fit for online accounting programs. Students will be exposed to the software and technology necessary for obtaining their associate degree in accounting. These include online spreadsheets, databases, bookkeeping software, and other computer applications. Students must be able to demonstrate mastery of basic mathematical skills and college-level algebra and will take courses on mathematical reasoning and logic as the basis for data analysis. Students also will take introductory courses to accounting and business to learn the basic principles of the industry that will help them to gain internships and other experience pertaining to the field. In their second year of an online associate degree in accounting, students generally earn to maintain accounting standards, as put forth by the Generally Accepted Accounting Principles (GAAP). The GAAP are a set of procedures, standards and principles that companies use when compiling financial information. The Certified Public Accountant (CPA) examination demonstrates to employers that you are a qualified professional accountant. Most states require candidates to hold a college degree in accounting before taking the exam, making the last year of an associate degree program an important part of the study and preparation process. The current CPA test is comprised of four sections and altogether takes 14 hours to complete. Upon successful completion of the course, students will graduate with an associate's in accounting, giving them the fundamental knowledge to jump straight into the workforce or continue their education. After completing an associate degree, students can either go straight into the workforce, or pursue further education options. Those who go on to obtain a bachelor's or master's degree can pursue more advanced careers opportunities in accounting. The following are some requirements for students to take into mind when graduating or transferring into a bachelor's degree program. Try to determine if your classes are transferable to a bachelor's in accounting program before you take them. Speak to an advisor or counselor and have them assist you in your plans to transfer credits to gain a higher degree in accounting. Check to see if your school has an education partnership or transfer agreement with other online schools or universities. Many schools offering associate degree programs have a partnership with other academic institutions that allow students and graduates to transfer their credits to these schools and earn a higher degree. Request your official transcript from your college of the classes taken in your associate in accounting program. This will need to be sent to the new accounting program. In order to be accepted into the program, your GPA needs to qualify. To continue of the accounting path, colleges may pay special attention to the grades you received in major-related courses at the associate level. In order to complete an online associate degree in accounting, students will be required to take a combination of general education and major-specific courses. Keep track of your progress on the requirements for your program in particular to earn your degree. An associate degree in accounting aims to equip students with a broad understanding of accounting basics and principles that can land them an entry-level position into the expanding industry. With an expected job growth of 11 percent by 2024, an associate in accounting degree can provide the education needed to get started in this promising field that with further education can lead to careers as a finance director, accounting software developer, or a forensic accountant. Here are some careers that an associate degree in accounting can lead to for prospective students. Financial clerks keep track of records, help customers, and perform financial transactions for government agencies, medical offices, or banks. There are many financial clerk specialties that include billing and posting, gaming, payroll and timekeeping, and policy processing clerks. Bookkeeping clerks produce financial records for organizations. They record financial transactions, update statements, and check financial records for accuracy. They must be proficient with math and technology software, such as online databases, spreadsheets, and bookkeeping software. The Certified Bookkeeper (CB) designation may be helpful for this career path. Administrative assistants work in a variety of settings, including business, medical, government and legal offices. Those with an associate degree in accounting would be best suited for administrative assistant positions that require basic bookkeeping and database filing duties. Certifications are available for those who want to specialize or advance in the field, including the Certified Administrative Professional (CAP) exam as well as options in the medical and legal fields. Accounting, like many other fields, has industry guidelines that instruct professionals on how to analyze, record and interpret information. The overarching standards for accounting are the Generally Accepted Accounting Principles (GAAP), which students in an online associate program should be introduced do. The basics of these guidelines form the building blocks to start working the in the field as well as a starting point for those seeking career and academic advancement. Bookkeepers, financial clerks and other entry-level accountants must be proficient in software such as QuickBooks and Microsoft Excel to succeed in the field. A solid understanding of the basic capabilities of these programs can prepare students to learn more advanced capabilities later on in their professional or academic careers. Look for online associate programs that provide courses and instruction that deal closely with these software and others, as it can prove to be a major resume booster. In order to properly file taxes and payroll documents, entry-level accounting professionals need to know the state and federal guidelines governing these practices. An online associate degree in accounting should introduce students to introductory tax concepts, such as gross income, deductions, exemptions and like-kind exchanges. Online students have many of the same resources available to them as on-campus students. Accounting students at the associate level can join professional organizations early on in their educations to start networking and get more exposure to the field.